Several thousand people have staged the first of a series of protests in Hong Kong over the World Trade Organization summit to be held this week. Some 9,000 police were on duty, but the march passed off without incident. The BBC's Chris Hogg in Hong Kong says there was a carnival atmosphere with protesters carrying colourful banners with slogans denouncing globalisation. Other demonstrations are planned for the opening day of the summit on Tuesday, and also for next Sunday. Around 10,000 activists are converging on Hong Kong to demonstrate at the summit, which will bring together nearly 150 rich and poor nations. The demonstrators say the meeting will largely benefit rich countries at the expense of developing ones. But supporters of the summit maintain that an international trade deal could generate billions of dollars in benefits and possibly lift millions out of poverty. The demonstration is the first event of what the organisers are calling Hong Kong People's Action Week. Protesters marched to government offices wearing T-shirts with slogans like "Junk the WTO" and "Stop collusion between government and business". 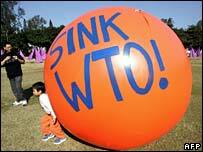 "We need to raise awareness of the true intention of the WTO," Tom Grundy, a UK activist dressed as a chicken told AP news agency. "It's undemocratically elected. It undermines and overrides any law a country wants to bring to protect workers and the environment." 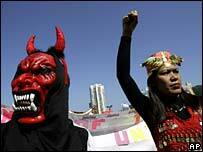 Many of the marchers were migrant workers from Indonesia and the Philippines. Sunday is their only day off. The migrant workers argue that the WTO's policies are unfair to their home countries, meaning more and more of them have to travel abroad to find work. "Protests are just one way of voicing our concerns, our issues, our demands," Mary Lou Malig of NGO Focus on the Global South told the BBC. "We are inviting everyone in the local public to come join us. It really is a lot of fun." However, police have stepped up patrols around the conference centre amid fears of a repeat of the violence which marred the 1999 meeting in Seattle and 2003 in Cancun. They say they understand the demonstrators have a right to protest, adding that they will be tolerant but will deal with any troublemakers firmly.